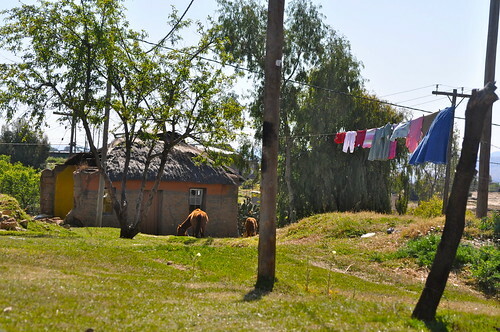 We headed for Lesotho with enthusiasm and we stayed in a village just north of Maseru. 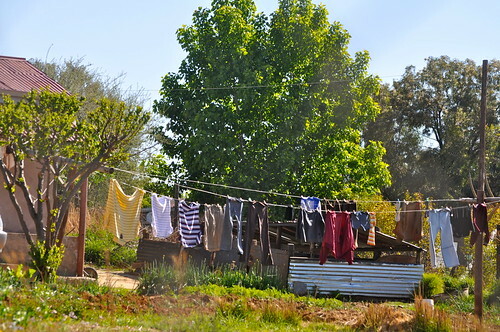 The best way to visit a different country is to live in it… we only had a week and we lived well. Somehow when you go somewhere, even if it is only a two day drive away, it can feel like a visit on the far side of the moon. 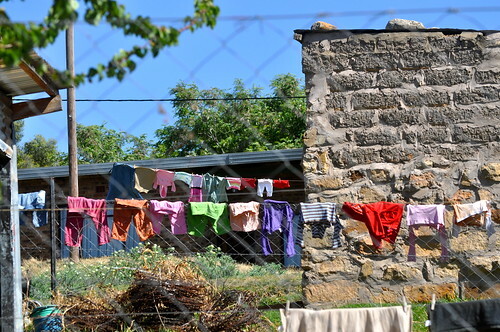 The differences between home and life in a Lesotho village very quickly became apparent. 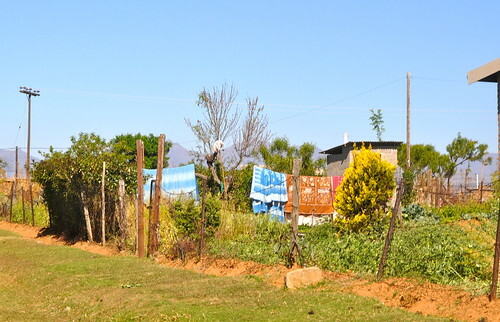 It was a wonderful experience for all of us, made so much better by the incredibly friendly and loving people that live in the village we stayed in. At home we live half way up a mountain with a view of the sea. 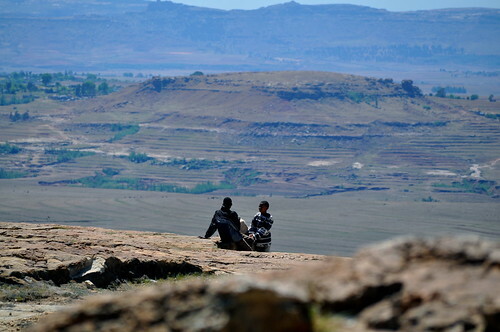 In Lesotho we lived halfway up a mountain with a view of forever. 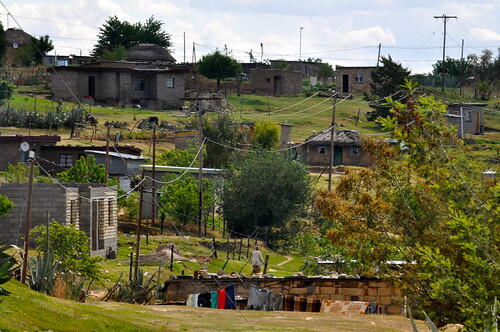 At home we live in a suburb: In Lesotho we lived in a village. 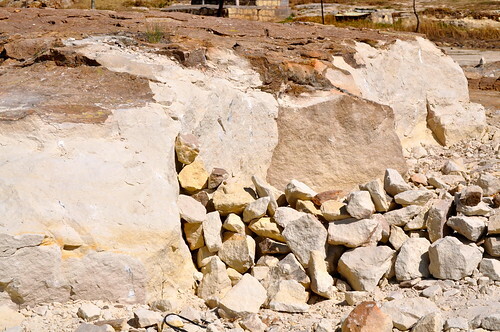 Stone is cut out of the hill side. 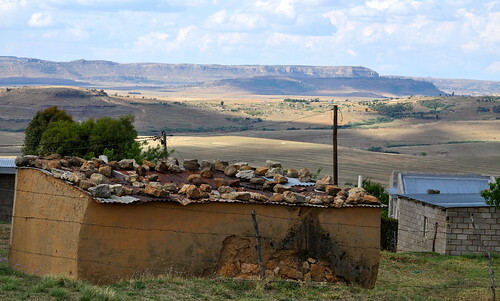 At home we have tiles on the roof: In Lesotho they have rocks – I am guessing it gets really windy there. 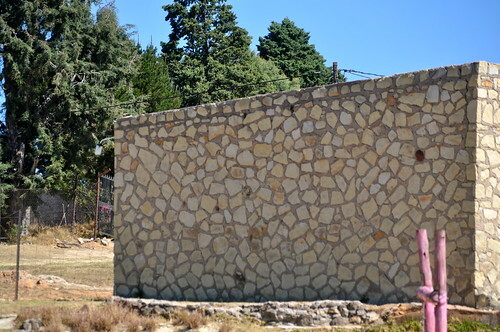 At home all houses have a bathroom: In Lesotho all houses have an outhouse. 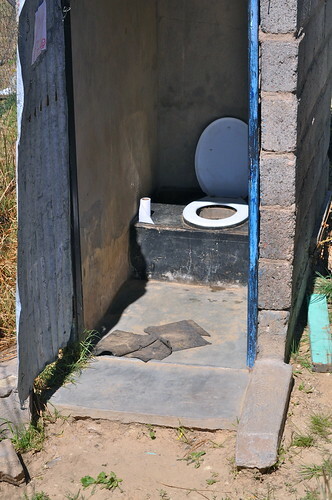 At home all toilets need flushing: In Lesotho – not so much!!! 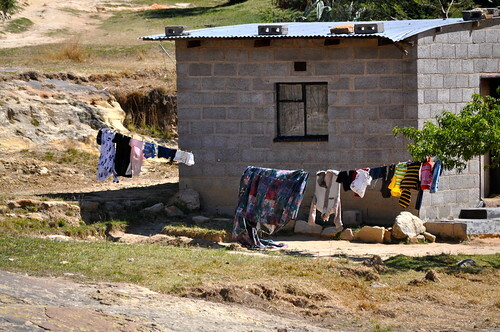 At home all houses have a shower or a bath: In Lesotho all houses have a basin and a washcloth. 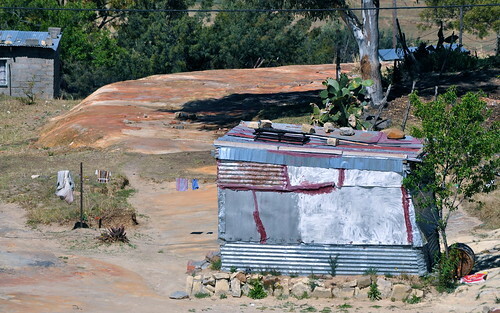 And you send the children to get water from the nearest tap in the morning. 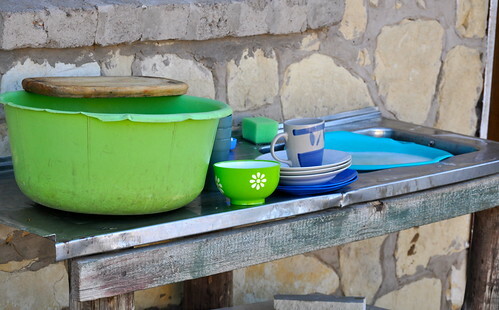 At home we wash dishes in the sink or the dishwasher: In Lesotho, not so much!!! I am just glad we weren’t there in the heart of winter because it sure got cold out there at night!!! 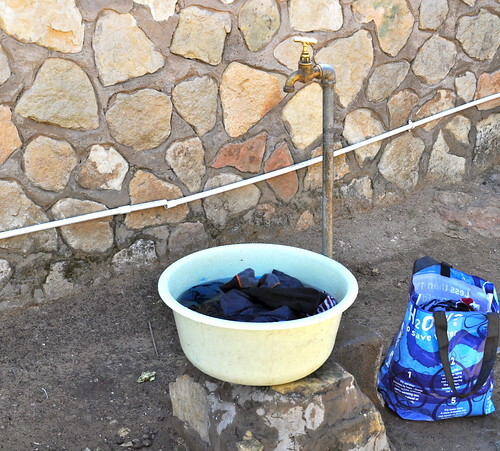 At home the kitchen has running water and electric outlets: In Lesotho there is a tap a few houses away to collect water or to do you laundry at. 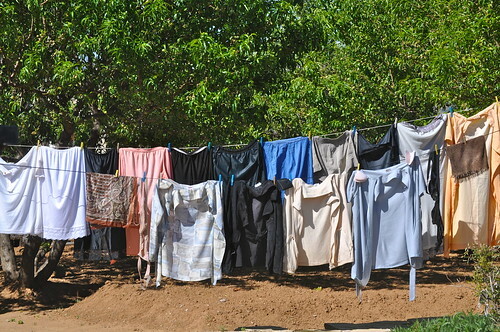 There are electric lights but outlets for appliances – not so much. 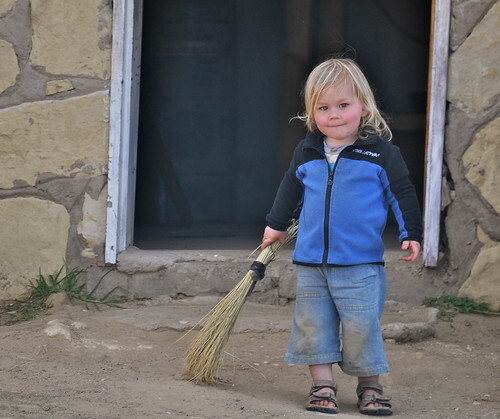 At home we sweep the floor after every meal: In Lesotho you sweep all day and brooms are half the length of ours. 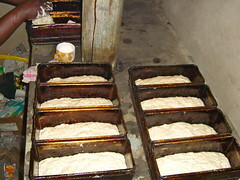 At home we bake our bread in a bread machine: In Lesotho they bake bread in a wood oven, in the communal kitchen, which keeps you warm on cold nights. 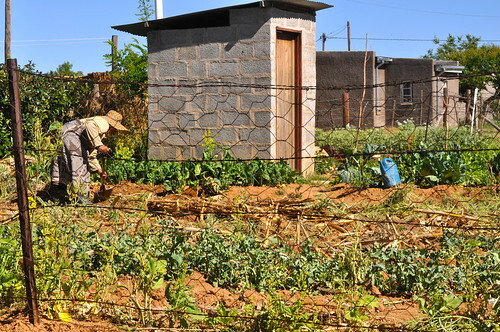 At home all our food comes smothered with packaging: In Lesotho every house has a little vegetable patch. 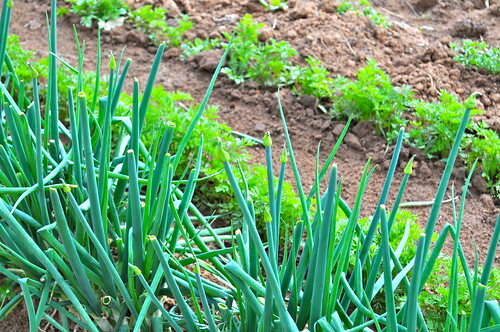 Hours of handwork go into these vegetable patches. And there is an altogether different kind of packaging. 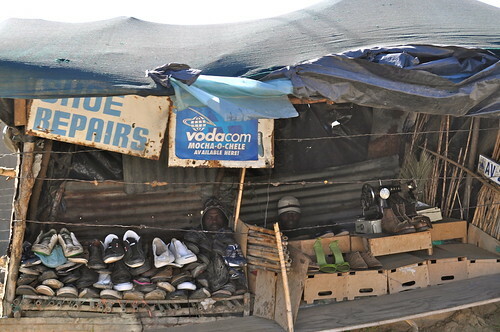 At home we do most of our shopping in stores: In Lesotho, shops are more open air. 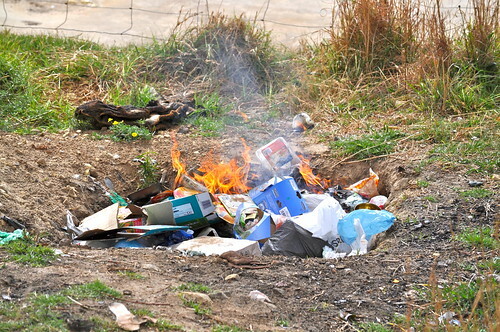 At home we get our garbage collected once a week with a truck: In Lesotho I never even saw a dirt bin. 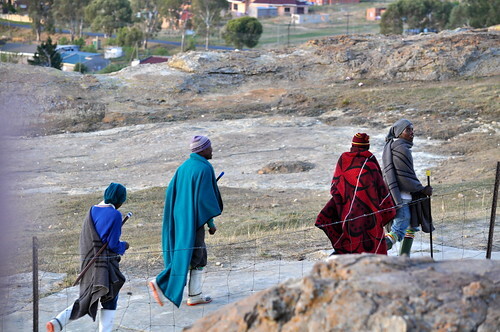 At home we use blankets on cold winter nights: In Lesotho everyone seems to wear blankets, with regal grace, whatever the weather. 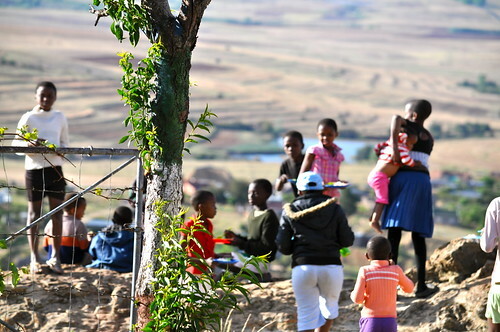 At home if there are children milling about then there are usually adults near by to watch over them: In Lesotho there are lots of children everywhere and not nearly enough adults to go round. 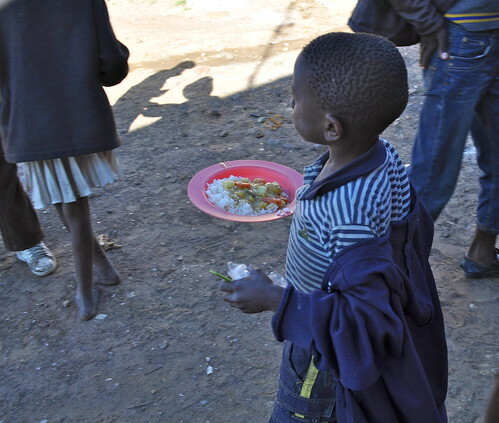 At home most kids we know are part of a family and eat a meal at least three times a day: In Lesotho many of the children are orphans, due to HIV/Aids, and in our village a feeding scheme provides them with one meal a day five days a week. 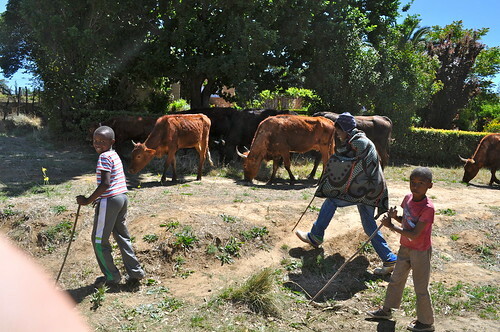 At home all kids are in school during the week: In Lesotho lots of young boys roam the hills looking after their cows and goats. 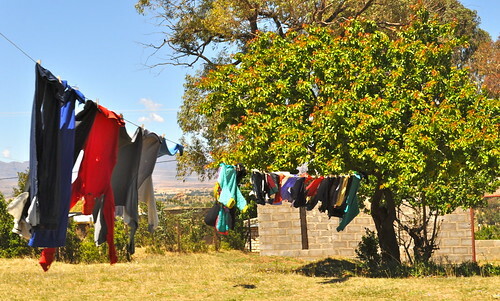 At home we do lots of laundry: In Lesotho it is just the same – pretty laundry bunting everywhere!!! 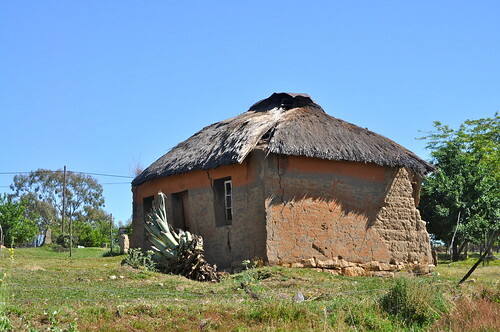 For all the similarities and all the differences of staying in a foreign culture, there was one huge difference between being at home and in Lesotho. 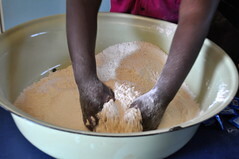 For all the hard work of life and all the difficulties the kids are experiencing there… there was no grumbling or complaining ever, in fact there was joy and happiness and the friendliest most welcoming kids we have ever met. We are privileged to have been invited to spend time with them. Hey se7en. You always see the positive side of things. The differences are amazing, aren’t they? Sometimes I wonder if we do not have too much. Thanks for sharing. 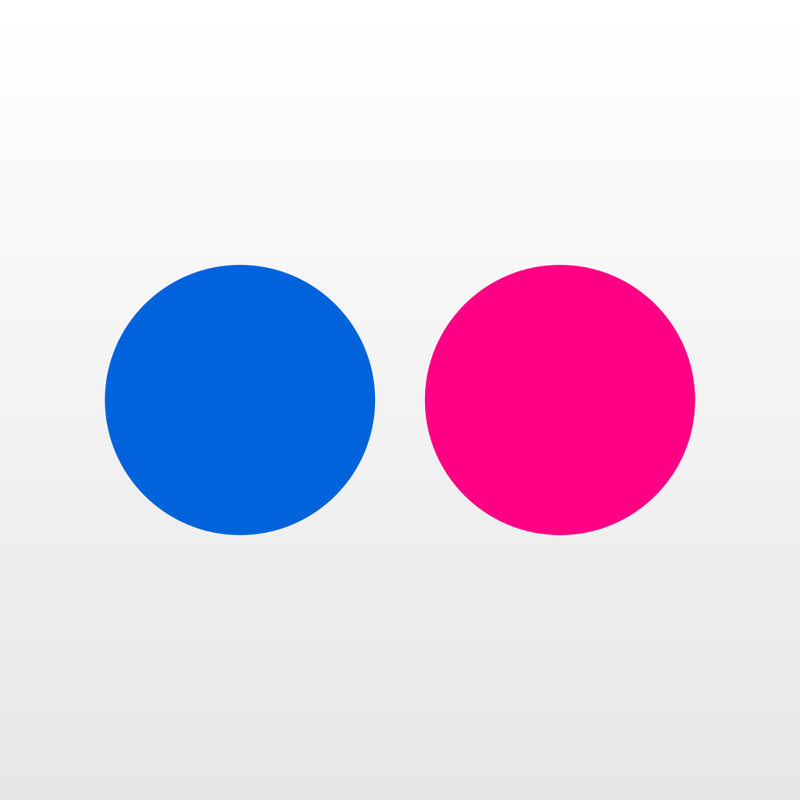 Hi Irene, The differences were amazing. 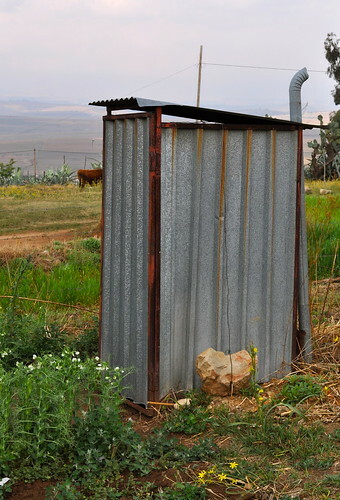 The first question everyone asks us is: How did we survive the pit loo’s but they were clean and fine and I would rather visit one of those loo’s than many of the flush toilets in rest rooms that we passed through on the way to Lesotho. 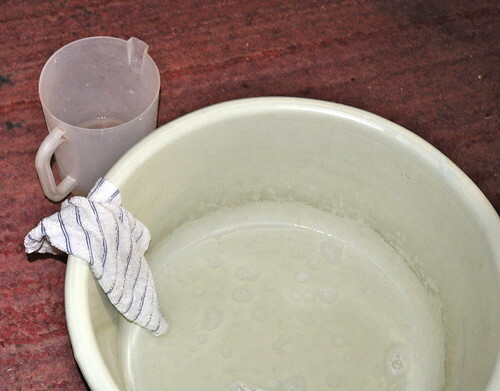 I think it is not so much about the stuff – because we have seen that having nothing doesn’t determine happiness… It is all about the hunkering after more and more stuff and the time consuming-ness of our material wealth. Really there was so much time to spend with each other and the kids had time to play all day because they weren’t busy with stuff… People before things really is a lesson that we need to take on board. 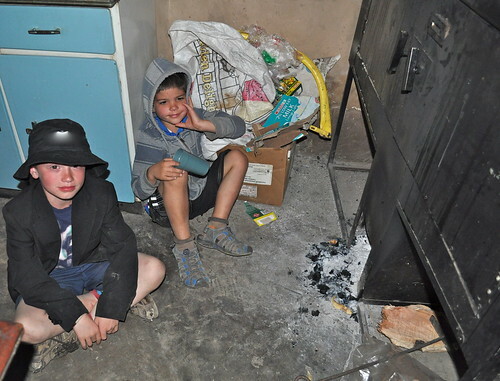 I was really touched by this post too – happy friendly children, and it is not like their lives are easy. 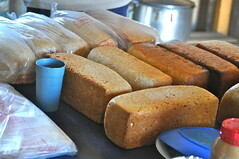 I long for a simpler slower life … Really people before things is a lesson I would like to take on board. 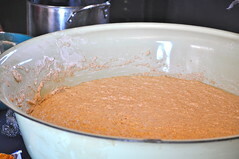 I have been wanting to find the WORDS to express my thankfulness to YOU and YOURS for this. That last pictures touches my heart so! It is breathtaking. 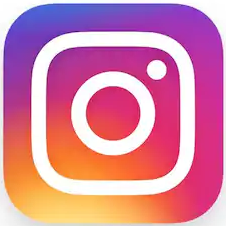 Your post is so powerful. 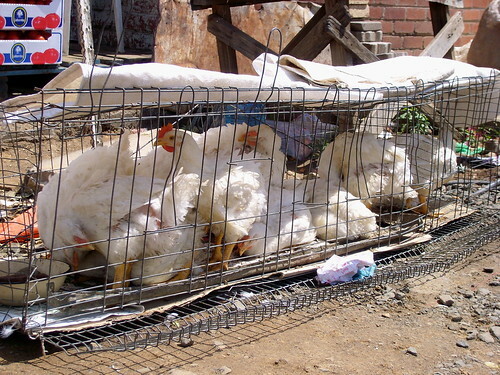 Thank you for poignantly showing us what it is really like. I will continue to pause with prayer and love for what we have and for the faces of hardship, yet exceptional beauty, you’ve shared with us. 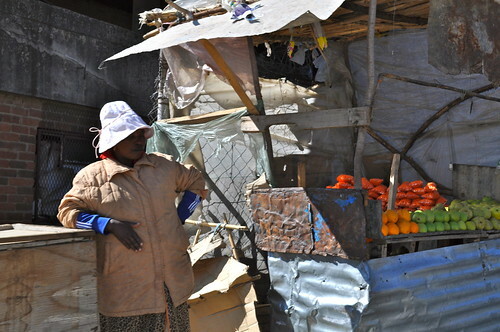 KM, I so appreciate this comment – that was my favorite Lesotho post and I thought maybe no one had read it!!! The last picture pretty much sums it up, worn happy faces – I love it!!! 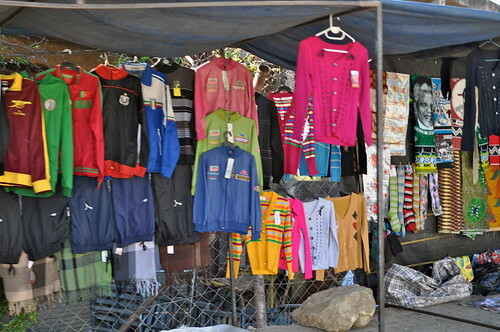 Many of my photographs of the kids had to be totally random – I only ever got one shot. As soon as they heard the click of the camera they would flock for a photo session… The kids loved having their photographs taken – and then seeing themselves on the camera screen!!! Every photograph ended up with a session of just holding my camera above the sea of happy faces and going: click, click, click!!!! Hope you have a good week!!! I love this post and the next one. It is fascinating to see the differences. I’m glad that you were able to go and post it up for us to see. I love their smiles that reach up to their eyes. Even if it is difficult to appreciate how their location and circumstances effect them, it feels good to see these smiles. 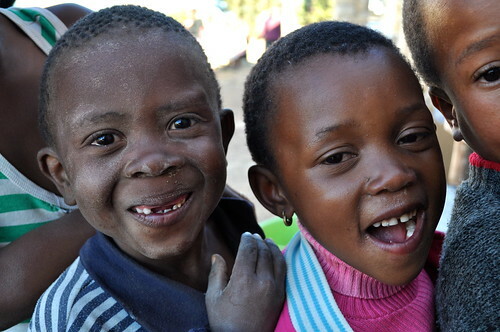 Cheryl, Thanks so much for the great comment – Smiles that reach up to their eyes just about sums it up!!! 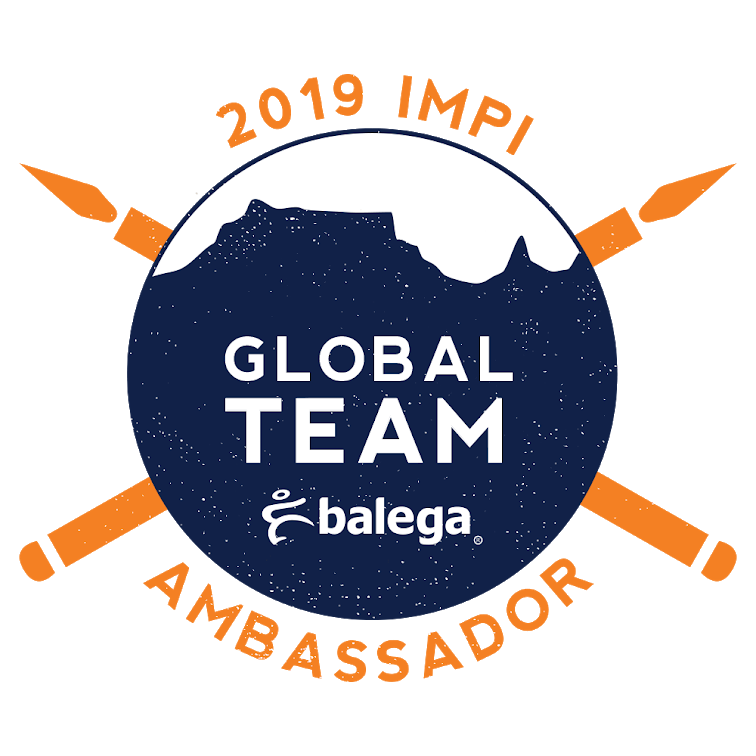 It was a great life experience and I fear my readers are going to be hearing just a little bit more about Lesotho over the next week or so!!! 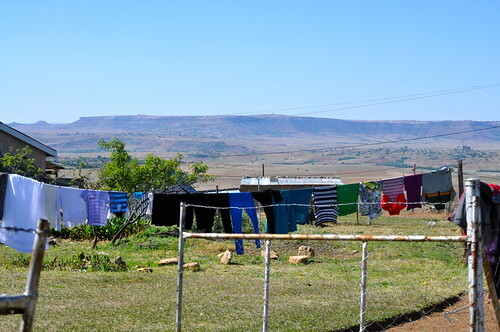 Im a homeschool Mom, leaving for Lesotho on Thursday (business trip – I also work from home). Unfortunately my son is not coming with now, in May…. but we are making a road trip, mid winter. Oh Launa, So happy to meet you!!! 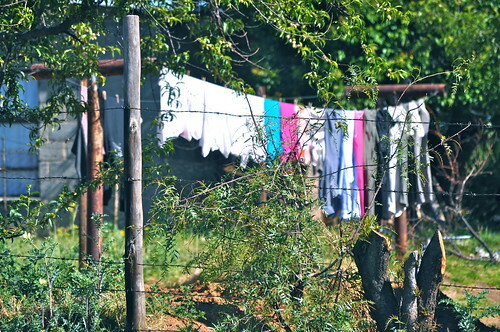 So excited for your trip to Lesotho!!! I hope you love it just as much as we did!!! What an amazing place and what incredibly friendly people!!! Honestly we think road trips are fun whenever we can take them – so a mid-winter one should be great too!!! Enjoy your trip, Let us know how it goes!! !